Cindy Archer, one of the lead architects of Wisconsin’s Act 10 — also called the “Wisconsin Budget Repair Bill,” it limited public-employee benefits and altered collective-bargaining rules for public-employee unions — was jolted awake by yelling, loud pounding at the door, and her dogs’ frantic barking. The entire house — the windows and walls — was shaking. For the family of “Rachel” (not her real name), the ordeal began before dawn — with the same loud, insistent knocking. Still in her pajamas, Rachel answered the door and saw uniformed police, poised to enter her home. When Rachel asked to wake her children herself, the officer insisted on walking into their rooms. The kids woke to an armed officer, standing near their beds. The entire family was herded into one room, and there they watched as the police carried off their personal possessions, including items that had nothing to do with the subject of the search warrant — even her daughter’s computer. And, yes, there were the warnings. Don’t call your lawyer. Don’t talk to anyone about this. Don’t tell your friends. The kids watched — alarmed — as the school bus drove by, with the students inside watching the spectacle of uniformed police surrounding the house, carrying out the family’s belongings. Yet they were told they couldn’t tell anyone at school. They, too, had to remain silent. The mom watched as her entire life was laid open before the police. Her professional files, her personal files, everything. She knew this was all politics. She knew a rogue prosecutor was targeting her for her political beliefs. Here before us are examples of the kinds of Tyranny that we are all subject to being terrorized with. The Rule Of Law has broken down. That more of us have not be treated thusly so far is only because Law Enforcement outside of Wisconsin is not as enthusiastic as the Despots are there. But, do not kid yourself: this type of thuggery could happen ANYTIME, ANYWHERE in America these days. Because we True Americans, those of us who believe in The Constitution and The Rule Of Law and not The Rule Of Man and who reject the Fundamental Transformation of this country into a Leftist Utopia, are resisting the Despots, they have declared us fair game, beyond the protections of Society. We have the freedom now to act to preserve The Founding; we are at Liberty to to operate in what has become the Enemy’s territory. We can gather together and Restore the Precious Gift of The Founding Fathers in territory we achieve control of. We are the Outlaws and we should act accordingly. We will see some very cruel times, but we have a Duty to our Posterity to preserve the Gift wherever and however we can. We have a duty to those that came before us and sacrificed for us to pay any price and bear any burden to see that Freedom and Ordered Liberty survive in some form. If we do not at least try, we shall be damned before all of Mankind as those cowards who did not attempt to preserve the last, best hope for man on God’s Earth. 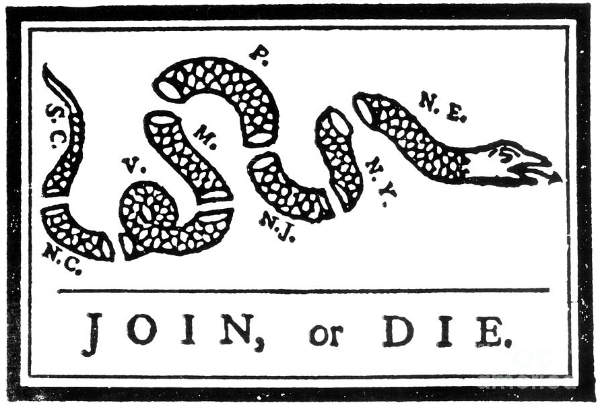 We must Join Or Die. I SMELL A WISCONSIN RAT: Reporter M.D. Kittle at WisconsinWatchdog.org asks a very interesting question: What did the Milwaukee Journal Sentinel know, and when did it know it? The question relates to the Journal-Sentinel reporters’ knowledge of a pre-dawn paramilitary-style raid of the home of Cindy Archer, a fomer aide to Wisconsin Governor Scott Walker and one of the architects of Wisconsin’s Act 10, which reformed that State’s public sector unions. Indeed, if it hadn’t been for the courage of Eric O’Keefe of the Wisconsin Club for Growth–who has defied the ridiculous gag order imposed on John Doe targets–the only knowledge the public would have today about the investigation would come from these one-sided, pro-investigation leaks. But getting the truth about an issue of such public importance shouldn’t depend upon the courage of one person…. Please do take the time to click here and read the whole post. BTW, this dovetails with the Progressive Left’s attempts to fundamentally alter American defamation jurisprudence. Now, a plaintiff in a defamation case must prove that the allegedly defamatory statement of fact is false. N.B. “Statement of fact,” not “opinion.” There is a movement to shift the burden upon the defendant to prove the truth of the statement. This is a subtle shift, but an important one, especially when dealing with political matters. You can see the difference in application when you consider the Clinton Foundation/Uranium Sale/Foreign Contribution story. Imagine defending a defamation action and having to prove the truth the inference of influence peddling drawn from the known facts but without a smoking gun, where all the smoking guns are controlled by the Clintons, as opposed to the Clintons having to prove the inference is false. Ditto the “John Doe” investigations in Wisconsin. I’m astounded that the first case involving john doe warrants wasn’t dismissed and the statute creating them struck down as unconstitutional. These raids seem like home invasions because that’s exactly what they are. The victims of these raids would have been well within their natural rights had they resisted with lethal force. Of course none of these victims had the firepower or an escape and evasion plan in place to make that survivable. Therein lies the problem. Is that what is required now to engage in conservative political or issue activism? Must our wives and children sleep next to the entrance to an escape tunnel, bugout bags at the ready while we fight a rearguard action?